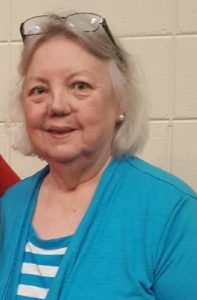 Audrey Mae Harrison, age 68, of Lawrenceville passed away Thursday, March 28, 2019. Audrey was a graphic artist for the Forsyth County News, Atlanta Journal and Constitution, Gwinnett Daily Post, the New York Post and New York Times. She was fascinated with the study of genealogy. At the request of Ms. Harrison, no services will be held. Survivors include her brother Larry Harrison and wife Doris; sister Avis Hawkins and her late husband Larry; niece Amanda Garrett and husband Richard; nephews Brent Harrison and wife Anita, Glenn Harrison and wife Jessika; great nieces Morgan Garrett, Sydney Harrison and Chelsea Adams; great nephews Bristol Garrett, Christopher Harrison, Jacob Harrison and Nickolas Harrison and a host of other relatives. She is preceded in death by her parents Amos and Flora Frost Harrison. Arrangements by Lawson Funeral Home, 4532 Hwy 53, Hoschton, GA, 30548, www.lawsonfuneralhome.org, 706-654-0966. I worked with Audrey and she was always a delight. We laughed a lot and rolled our eyes as needed when Melvin Hunnicutt was in rare form or Johnny Solesbee would tell a funny (or not so funny) one. She was a diligent worker and talented as well as kind-hearted. Glad to have crossed her path on this earth. I worked with Audrey for over twenty years. She was one of the most kindest and responsible people I have ever met in my life. She was very very dear to me and we were very close. After she left the paper we didn’t keep in touch that often but we had lunch about 6 months ago and we caught up. I’ll never forget having that time with her. I know she talked about her niece Amanda and her brother Larry and her other family members very often. R i p my precious Audrey. If one of the family members would please contact me I would like to know about her final days. Audrey was one of the world’s nicest people. We worked together for many years and she was a great co-worker. She was a giving, kind person always willing to go out of her way to help others. She was loyal to her family and always very proud of the accomplishments of family members. The world has lost a gentle soul. I was a Dacula High School Class of 1969 classmate of Audrey’s. She was such a kind person and always had a sweet smile for everyone. We will remember her at our 50th class reunion later this year. Ms. Audrey and I worked together at the Gwinnett Daily she was a very special lady . So sorry to see her passing. Always a joy to be around. Prayers to the family at this time. I worked alongside Audrey for a long time at FCN. She had the biggest heart of anyone I’ve ever known. She worked hard and poured herself into her work, and took care of her mother for so many years under very trying circumstances. But she was always there to offer a shoulder to cry on and give a hug to anyone who needed it. The true measure of a person is how they lived their life and whether they left this world a better place than when they came into it. Audrey brightened my life and was an extraordinary example of courage, perseverance, and compassion. Rest in peace sweet girl.